The "Public" Broadcasting Service and Bill Moyers are using your tax dollars to deliver their biased view of the Second Amendment to the nation`s high schools. It is well documented that the media elite are hostile to Second Amendment rights. That hostility is now taking shape in a direct effort to influence the way American children are taught about civil liberties. 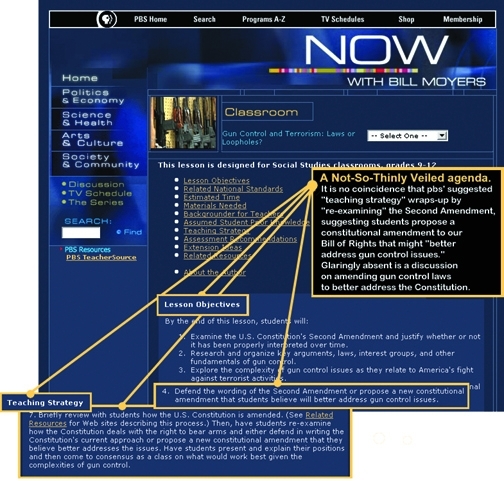 The Public Broadcasting Service (PBS) program now with Bill Moyers has included on its Web site (www.pbs.org/now/classroom/gun.html) an extensive "lesson plan" for teachers to instruct their high school students about the Second Amendment. Its title is the first sign that objectivity will not be a paramount goal: "Gun Control and Terrorism: Laws or Loopholes." While the plan arguably has a paper-thin veneer of balance, an examination of the materials recommended as resources and the links provided to information sources quickly reveals that this "plan" has an ulterior motive: to promote the view that there is no individual right to bear arms. The plan admits that NRA is a part of this debate, but provides only the most general information on NRA activities and positions, while providing specific links to fact sheets and opinion pieces from the gun-ban lobby--groups such as the Brady Campaign and the Violence Policy Center (VPC). Of the 12 people appearing in the piece, one is neutral, two are pro-gun rights and nine are hard-line anti-gun zealots such as u.s. Senators Charles Schumer, D-N.Y., Edward Kennedy, D-Mass., and Jack Reed, D-R.I. And that does not include the "reporter," Deborah Amos, who takes a pointedly anti-gun rights view throughout her report. Fairness is nowhere to be seen in this "lesson plan." The PBS Web site promotes a November 2002 episode of now described as an "in-depth report of gun control and terrorism." In reality, however, it is simply an attack on Attorney General John Ashcroft and the rights of gun owners. The "in-depth report" makes no attempt to provide facts, instead providing a forum for an anti-gun diatribe. PBS` message is clear: America`s lax gun laws allow terrorists to arm themselves, and, therefore, the rights of law-abiding gun owners should be curtailed and their privacy invaded. The show fails to provide, however, any real evidence that the claims have merit. The plan relies on sensationalized, politically charged hit pieces, such as the article "How u.s. Dealers Arm the World" from the hard-left The Nation as a resource recommended for teachers and students. It also provides direct links to two "fact sheets" from VPC that try to tie our Second Amendment freedoms to terrorists. It fails, however, to provide meaningful links to accurate, dispassionate information on firearms, firearms laws or the Second Amendment. Most glaringly, the plan purports to lead a discussion in the meaning of the Second Amendment, but studiously ignores the multitude of scholarly articles that present the real issues of this debate. While the Brady Campaign`s distorted and ill-conceived arguments about the meaning of the Second Amendment are linked to directly, there is not even a partial listing of the myriad independent scholarly articles that have been written on the origins and evolution of the right to bear arms in America. There is no reference to law journal articles or comprehensive studies by leading scholars such as William Van Alstyne, Akhil Reed Amar, Robert Cottrol, Clayton Cramer, Stephen Halbrook, Don B. Kates, David Kopel, Sanford Levinson, Nelson Lund, Joyce Lee Malcolm, Glenn Harlan Reynolds or Eugene Volokh, to name but a few. All these scholars have published widely on the right to keep and bear arms, and their research supports the historically accurate view that the Second Amendment protects an individual--not a collective--right. The bias continues throughout the information provided. One link provides a "history" of gun control laws, with prefacing remarks that lament the lack of new gun control legislation or the passage of handgun registration. Moyers even provides a link to a site called "Sane Guns" which provides a "History of the NRA" that is simply an undisguised--but embarrassingly sloppy--attack on the Association. Perhaps it never occurred to Moyers to allow NRA to provide its own brief history. The message is easy to understand: current and additional gun laws are vital, reasonable and needed, and the "special interest" gun lobby is standing in the way of the national good. This is not the first attack on the Second Amendment that has been financed by PBS with your tax dollars. It is simply the latest. However, its target should be of particular concern to all who value our liberties and the quality of education our youth receive. By attempting to turn classrooms into echo chambers of anti-Second Amendment dogma, Moyers and PBS erode public trust in our schools.The future of our rights can only be protected if our children are taught that the fight is constant. To continue the fight, they must be armed with the truth, not shackled by revisionist history force fed them by an anti-gun elite. This effort by PBS to undermine the Second Amendment by spreading anti-gun propaganda in our schools will only succeed if we stand by and silently allow it. You can look up local PBS affiliates at www.pbs.org/stationfinder/ index.html. Also, you can contact your u.s. Senators and Congressman, as well as your state representatives and local officials, by using the "Write Your Representatives" feature at www.nraila.org. to let them know what you think about the expenditure of public money to promote an anti-gun political agenda. Textbooks and the Second Amendment. The effort to use our schools to indoctrinate the young people of America against the right to keep and bear arms is not new. A decade ago, the American Rifleman described a study of the content of textbooks used in classrooms around the country ("2nd Amendment: A Right Left Out," February 1993.) That study found that the most common treatment of the Second Amendment was to not treat it at all. Most textbooks simply failed to discuss the topic in any meaningful way. Those that did most often tied any right to bear arms to the militia or bluntly claimed there was no individual right to arms. "A citizen`s right to bear arms is related to the maintenance of a militia." "The 2nd Amendment is widely misunderstood. It was added to the Constitution to protect the right of each state to keep a militia." "The Second Amendment guarantees Americans the right to serve in a state militia to bear arms." "The Second Amendment . . . acknowledges the necessity of state militias to keep and bear arms." --Exploring America`s Past, Holt Rinehart and Winston, ISBN 0-03-011634-1, pg. 163. These inaccurate interpretations of the Constitution are presented as unchallenged fact. The interpretation supported by the overwhelming majority of constitutional scholars--that the Second Amendment protects an individual right--is completely ignored. The lesson for parents here is apparent: we must all take care to know what is being taught in the textbooks our kids are reading, and take action to correct the inaccuracies or fill in the information they are not getting.